This month’s spotlight shines on Shereese Maynard (@ShereesePubHlth), managing director of Envision Care and host of the #healthITchicks chat on Wednesday, October 19 at 1pm ET. Shereese has lived with her husband (@AnthonyCFO) and four children in Maryland for the last decade. She counts The Brooklyn Museum of Art, breast cancer survivorship causes, and The Mount Washington Children’s Hospital as among her favorite causes. When it comes to social media communities, Shereese has a number of favorites including #hcldr, #kareochat #HITmc, #HITsm, #healthITchicks, #Healthxph, #BizGalz and #Rubhusocial. “I usually participate during my lunch breaks or in the evening,” she explains. Favorite apps – healthcare or otherwise – include Starbucks, EasilyDo, and StatChat, while favorite books include “Swimming Pool Season” by Rose Tremaine. Shereese adds that she’s enjoying “Radio Girls” by Sara-Jane Stratford right now. How have you seen women make a difference in health IT during your time in the industry? Is there one woman in particular whose contributions have stood out? The biggest place I’ve seen women make a difference is in making mHealth available to rural communities. I consult with a lot of women-owned healthcare businesses and they seem to be reaching out to bring remote monitoring and mobile health technologies to underserved communities. Bettina Experton of Humerex is a visionary in my opinion, and I have a great deal of respect for her. Do you feel that the industry is where it needs to be in terms of offering equal advancement/leadership and mentorship opportunities? While we are making strides, equal advancement and leadership opportunities still evade talented women in this field, and venture capital and angel investment opportunities are rare. We have a long way to go. What organizations and resources do you follow that have helped you professionally, especially with regards to being a female health IT professional? I can honestly say, I’m self-made. As a female and an African-American, resources and opportunities are very rare. I credit the University of Maryland for my academic successes, but curiosity spawned my development. Other inspirations came from other fields, to include finance (Melody Hobson) and the countries Italy and Canada for approaches to health IT. What are you looking forward to chatting about during the #healthITchicks tweetup on October 19? I would love to discuss the Elizabeth Holmes situation (Theranos) and why female health IT professionals should be discussing her issues. Blockchain uses in healthcare and why/how women disruptors should be working in this space. Collaboration in HIT. Why we should be sharing for quality care HIT initiatives. Where to find project support and apps that work for HIT project management. Hospitals, surgeons, and centers, oh my! How women can sell HIT products to this niche group. (I’ve been speaking on this topic this year). 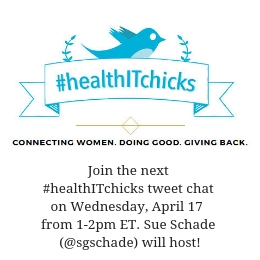 Join me (@JennDennard) and Shereese Maynard (@ShereesePubHlth) for the next #healthITchicks chat on Wednesday, October 19 at 1pm ET. You can also connect with us on LinkedIn via the #healthITchicks group.